PowerPoint 2016: Creating and Opening Files | Tutorials Tree: Learn Photoshop, Excel, Word, Powerpoint and Wordpress for free online. Backstage view serves as the most important view with the frequently used features. This view provides you with different options to create and work on the presentation. Once you go to File, you will find the following options. 1. Info: This option provides you the general information about the file. You can protect, inspect and manage your presentation files here. You can see the file Properties here along with the dates and people related. 2. 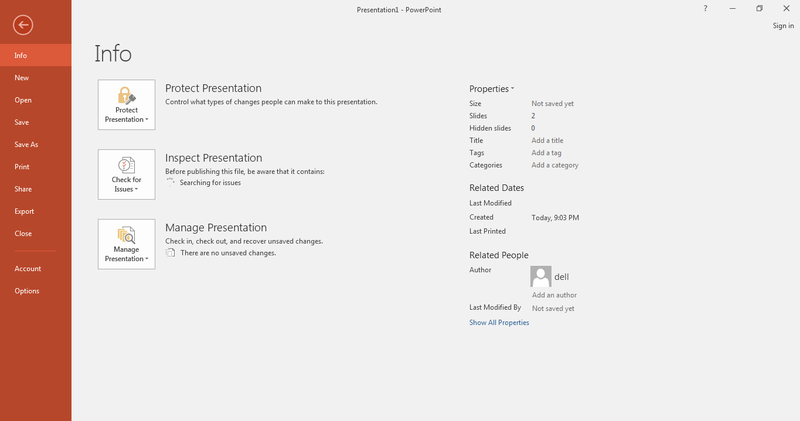 New: This option allows you to create a new presentation. 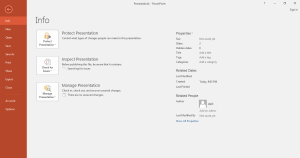 You can either select a blank presentation or choose from the templates given there. You can also search for more templates online by entering your keywords in the search box. 3. Open: Here, you can open the existing presentations present at different places. Recent: You can view the recently opened files here which can be directly accessed. OneDrive: You can access your files from the drive present on the cloud. This PC: The files stored at different places in the system can be opened using this option. 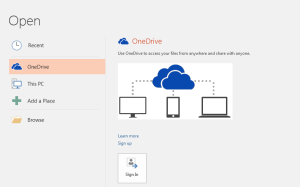 Add a Place: You can add new locations here from OneDrive or Office 365 SharePoint. Browse: You can browse the locations of your system with this option. 4. Save and Save As: Option Save will save the changes done in your file. You can save in another format or with a different name using Save As option. 5. Print, Share, Export: These are advanced options to print, share and export the file which will be discussed in detail in the coming tutorials. 6. Close: This will close the application. It will give options to save the changes before closing.